Balzer + Bray, 9780062024688, 560pp. For fans of The Chronicles of Narnia comes the first book in the Wildwood Chronicles, the New York Times bestselling fantasy adventure series by Colin Meloy, lead singer of the Decemberists, and Carson Ellis, acclaimed illustrator of The Mysterious Benedict Society. In Wildwood, Prue and her friend Curtis uncover a secret world in the midst of violent upheaval—a world full of warring creatures, peaceable mystics, and powerful figures with the darkest intentions. And what begins as a rescue mission becomes something much greater as the two friends find themselves entwined in a struggle for the very freedom of this wilderness. A wilderness the locals call Wildwood. Wildwood captivates readers with the wonder and thrill of a secret world within the landscape of a modern city. It feels at once firmly steeped in the classics of children's literature and completely fresh at the same time. The story is told from multiple points of view, and the book features more than eighty illustrations, including six full-color plates, making this an absolutely gorgeous object. 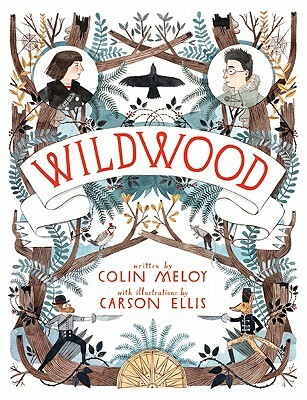 Colin Meloy is the writer of the bestselling Wildwood Chronicles and the singer and songwriter for the band the Decemberists. The Golden Thread: A Song for Pete Seeger is his first picture book. He once joined Pete Seeger onstage, singing American folk standards at the Newport Folk Festival in 2011, and even now, he can barely believe it actually happened, it was so cool. He lives just outside Portland, Oregon, with his family. Carson Ellis is the illustrator of a number of books for children, including the Wildwood Chronicles, and is the author and illustrator of the picture books Du Iz Tak?, a Caldecott Honor winner, and Home. Carson lives just outside Portland, Oregon, with her family. Meloy has an immediately recognizable verbal style and creates a fully realized fantasy world…. Ellis’s illustrations perfectly capture the original world and contribute to the feel of an instant timeless classic. Further adventures in Wildwood cannot come quickly enough. WILDWOOD is an irresistible, atmospheric adventure - richly imagined and richly rewarding. This book is like the wild, strange forest it describes. It is full of suspense and danger and frightening things the world has never seen, and once I stepped inside I never wanted to leave. A satisfying blend of fantasy, adventure story, eco-fable and political satire with broad appeal; especially recommended for preteen boys. WILDWOOD is a beautiful object and a beautiful read. One half fairy tale, one half coming of age story, one half unrepentantly gorgeous work of art, this book is overflowing with gifts. Dark and whimsical, with a true and uncanny sense of otherworldliness, WILDWOOD is the heir to a great tradition of stories of wild childhood adventure. It snatched me up and carried me off into a world I didn’t want to leave.